Bussmann Tron® HEX Series 2 -Pole Fuse holder is suitable for using with Class CC 13/32 x 1-1/2-Inch fuses and KTK 1/10 - 30-Amp BAF, FNM, FNQ types fuse. It is rated at 600-Volt AC. 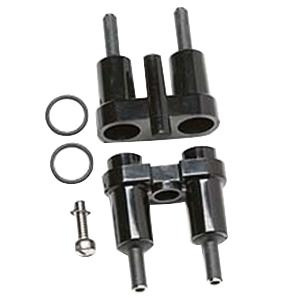 This in-line mountable fuse holder measures 7.12-Inch x 3-Inch x 1-Inch. This fuse holder with copper crimp terminal connection, accommodates one solid/stranded wire of size 12 - 8-AWG and two solid/stranded wire of size 12-AWG. Fuse holder is UL listed and CSA certified.